The real-time strategy genre has a lot to recommend it: tactical thinking, fast-paced unit and resource management, and multiplayer atmosphere that's unlike anything else in gaming. But it's hard to escape the fact that in order to have a real RTS, you just need a mouse. Precise movements and commands are nigh impossible on a touchscreen. 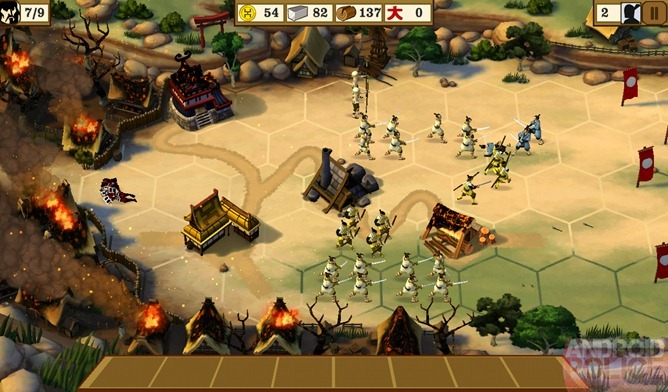 Sega's Total War Battles: Shogun is a spinoff from their wildly successful Total War PC franchise, which breaks with tradition and tries to adapt the RTS genre to the touchscreen. Unfortunately, just about everything that makes a strategy game enjoyable is lost in translation. 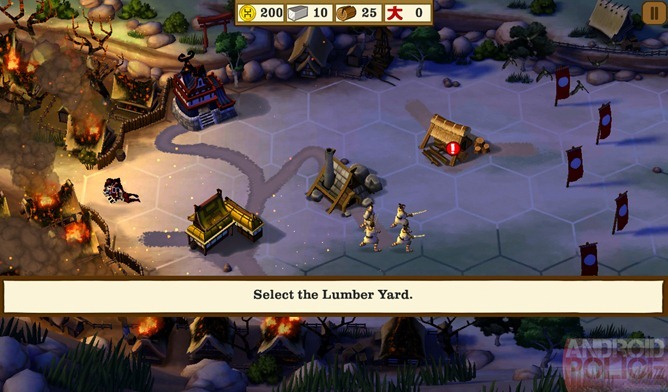 Some of the staples of real-time strategy are here: bases with buildings which manufacture units, gathering different kinds of resources, incremental technology upgrades. But instead of being given a basically open map, you're restricted to a hexagonal grid. Buildings must be fit into an area never more than five or six spaces high, which is frustrating when the buildings themselves take up three to four. Some of the placements are baffling, as well - everything needs to be connected by roads, but thanks to the strange shapes imposed upon the buildings, getting an efficient layout is nearly impossible. Arbitrary restrictions are killers when building bases. 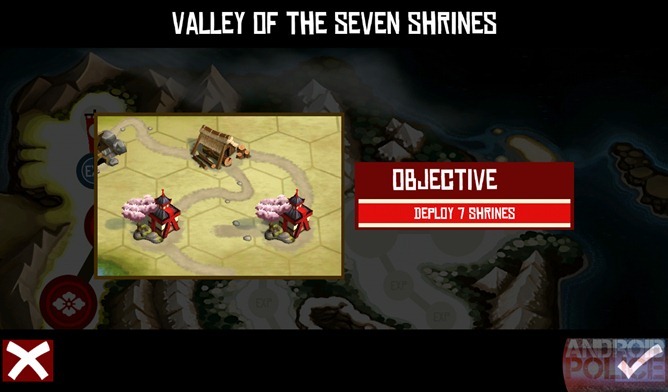 For example, a Temple which spawns monks takes four spaces, effectively blocking anything around it, and must be connected to a logging camp. But it can't be anywhere near a market, and like other buildings, it can't overlap existing roads. It's a good thing that you can destruct and move any building at any time, or a single placement could ruin an entire match. As it is, creating your base becomes a tedious game of hexagonal musical chairs. The units are nearly as frustrating. 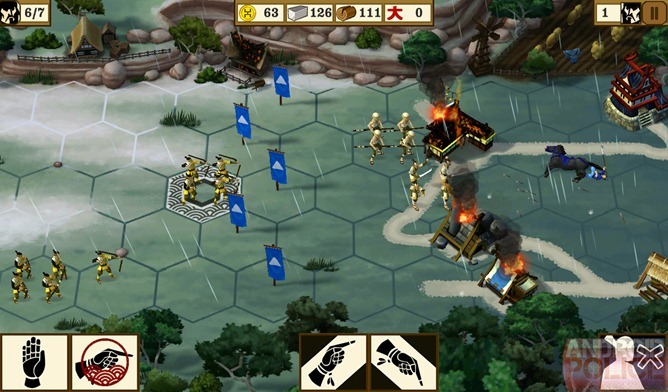 Spawning infantry, cavalry or archers creates a few units that are restricted to the same grid, meaning that close-quarters fighters are limited to attacking the three spaces in front of them. Archers and gunmen can attack longer distances, but only in a straight line. In order for infantry to attack something more than one space away, or for archers to attack up or down, you'll have to use the up and down movement commands, a step that takes an extra motion and can only be performed once in a while. Add to that the fact that even the fastest unit crawls across the map, and you get a "real-time" strategy game that plays a lot more like a board game (or a really slow match of Plants vs Zombies) than anything else. While it's possible to use traditional strategy to outwit your opponent, it's generally easier just to spam archers with a few infantry in front to slow down the line. The most important resource is space, not gold or wood, which seems like a poor basis for strategy. While multiplayer is present, I found it hard to establish a stable game with Sega's matchmaking service. 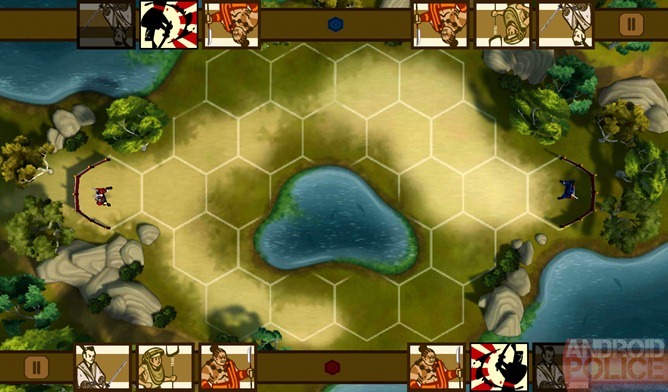 When you can find a human opponent, the matches are without buildings or resources: each side gets a set number of units to deploy, and they duke it out until one general is down. Again, this is more like a board game than a real-time strategy game. Multiplayer is best avoided, which is a downright shame. The campaign is easy, whenever buildings are taken out of the equation. You can fly through the simple story mode or take side missions to build up experience, thus making your buildings and units more effective for later battles. Your upgrades won't carry over into the multiplayer or skirmish modes (not that they should) which makes the side missions little more than busy work. The computer opponents are laughably easy once you get the mechanics down. 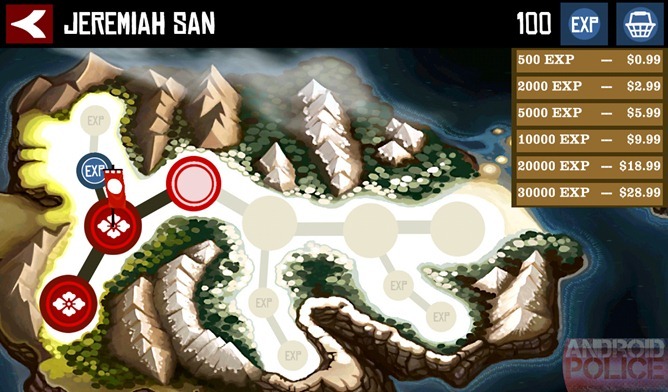 Those looking for challenge will have to enter the skirmish mode on hard or "Shogun" difficulty. And perhaps tie one arm behind their back. On the other hand, the graphics and production values are surprisingly appealing. Breaking from the absolute realism of the PC Total War games, Total War Battles goes with a more colorful cartoon style that fits the overall feel of the game. You won't see any blood, but there's plenty of luscious scenery, and you could be fooled into thinking that you were looking at a strangely-annotated wall decoration while playing the game. The campaign has cut scenes, of a sort, and some filler story with decent voice narration. If only the cartoony style was supplemented with better menus - figuring out which buildings and units you're using with the simplistic icons can be very difficult. Total War Battles won't push your phone or tablet's graphical abilities, assuming it's less than 18 months old. This lowers the barrier to entry, which is nice, but it seems that Sega is having trouble deciding which phones and tablets are compatible. Many are reporting that the Nexus 7, which should be able to eat this game for breakfast, can't access it in the Google Play Store. 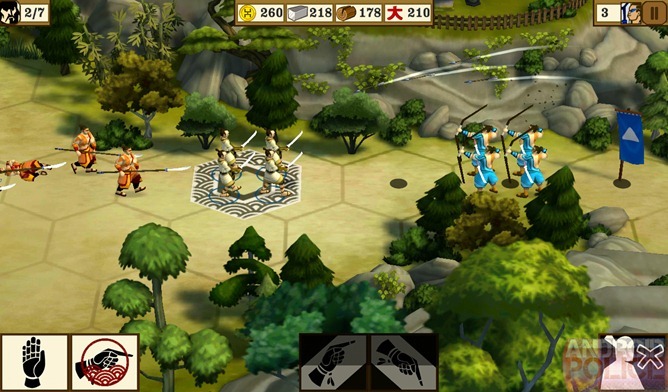 Total War Battles: Shogun is $4.99, which places it at the high end of Android games. Considering the production values and the work that went into it, it's certainly reasonable for Sega to charge that much... or at least would be if the game were more fun. Unfortunately, Sega has committed a cardinal sin in this reviewer's opinion by injecting in-app purchases (specifically experience boosts for the single-player campaign) into a paid app. This sort of thing is annoying enough, and all too common, at the $1 and free level. But trying to squeeze more money out of what should be a "premium" experiences leaves a poor taste in my mouth. Developers: pick a monetization strategy (paid, ad-supported, or in-app purchases) and stick with it. Don't try to nickel-and-dime your players by mixing and matching. Sega and The Creative Assembly should be applauded for trying to make traditional strategy work on mobile, but the execution leaves a lot to be desired. Total War Battles: Shogun is at best annoying, at worst incomprehensible and unnecessarily slow. The production values are appealing, but can do nothing to help what is a deeply flawed game to begin with. The addition of in-app purchases to an already expensive game is the nail in the coffin.